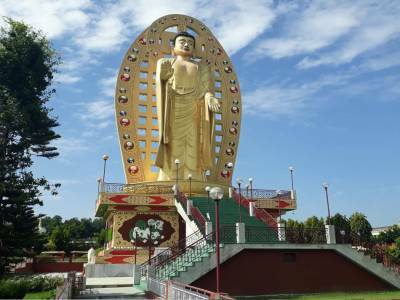 The Mindrolling Monastery is one of Dehradun’s famous landmarks and is known for its beautiful architecture, impressive interiors and peaceful surroundings. The legend says, the local Tibetan community was harassed by a menacing problem - brewing and consumption of illicit liquor. All that the local police could do was to arrest a few people, put them behind bars and then release them after a few days. Then a young DSP (Dy. Suptd of Police) came to be posted in Dehradun. He realized that this was not the way to really solve the problem. So, he went to the local Lama and requested for his help in solving the problem. The lama thought for a while and then said, "There is only person who can really help in solving the problem and that is the Honorable Dalai Lama. Let us go to him". So a team of four people which included the DSP and the lama went to Dharamshala to seek Dalai Lama's advice. Dalai Lama had the answer. He said, " Go back and build a temple which would be the pride of not only Dehradun, but of the entire nation. 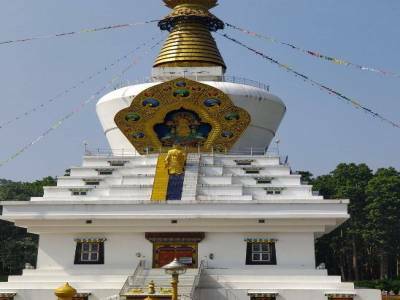 Build the tallest stupa of Lord Buddha in Asia. People from all over the world would come to visit and to worship. The local would get employment and, of course, no one would commit a sacrilege of brewing or consuming liquor around the holy temple". 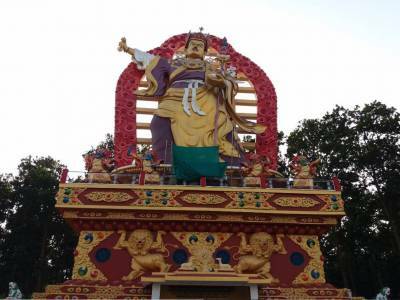 With these blessings from the Holy Dalai Lama, the construction of the temple was initiated and the foundation stone was laid by the then Hon'ble Minister of Defense, George Fernandis and the temple was solemnized by the Dalai Lama himself in 2002. 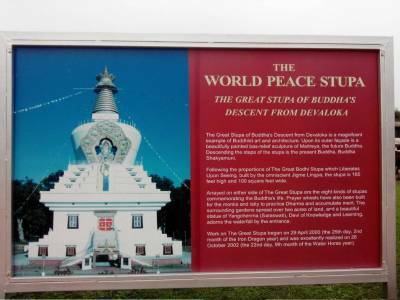 Naturally, the problem of consumption of alcohol got automatically eradicated and a temple of Buddha with the tallest Stupa of Lord Buddha in the whole of Asia came up. The temple has four stories - each representing a different Avatar of the Lord Buddha, but with one universal message of love, peace, and harmony. On Sunday mornings, visitors are allowed to go to the terrace from where you get a panoramic view of the entire Doon valley, and there are many other places to visit inside the complex of the temple - like shops, cafeteria and the garden. For a visitor with more time and interest, there is a Buddhist Monastery, too. Mindrolling Monastery about 10 kms from Dehradun. 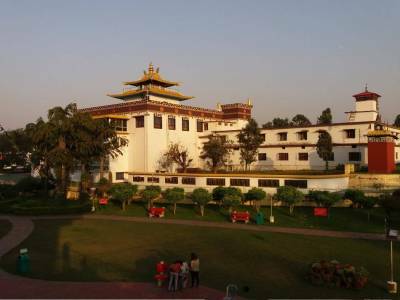 Get quick answers from travelers who visit to Mindrolling Monastery, Dehradun.